This document was first released by the hacktivist collective known as Anonymous. 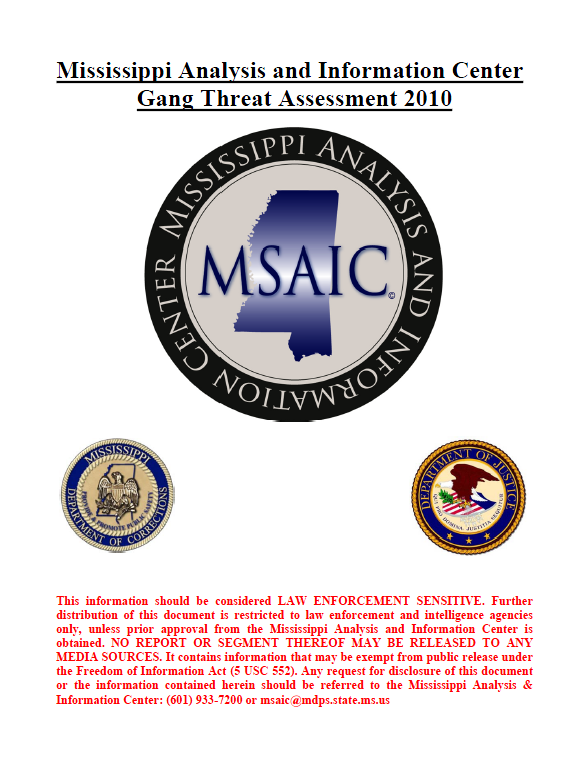 The following Gang Threat Assessment, prepared by the Mississippi Analysis and Information Center (“MSAIC”), was produced to provide a general outlook of gang presence and criminal activity in the State of Mississippi. Data in this report was obtained from the Mississippi Department of Corrections (“MDOC”) and provides statistics, research and key findings from corrections data, law enforcement reports as well as academic and open source research. This assessment is a follow-up from the Interim Gang Threat Assessment issued by MSAIC in September of 2010. The assessment contains crimespecific and corrections statistics attributed to the four most prevalent gangs (“core” gangs) in the state: Gangster Disciples, Simon City Royals, Vice Lords and Latin Kings. From the four core groups they are attributed to the higher affiliations which are Folk Nation (Gangster Disciples and Simon City Royals) and People Nation (Vice Lords and Latin Kings). The assessment also includes brief descriptions of other gangs including MS-13, Aryan Brotherhood and Outlaw Motorcycle Gangs. Gang members in Mississippi continue to be involved in a number of criminal activities, the primary goal of which is to make money. Most frequently, gang members are incarcerated for drug violations, burglary, larceny, robbery, and assault. Although the gangs present in Mississippi may use the same name as the highly-organized, Chicago-based gangs, they primarily operate independently in Mississippi and do not appear to be in the hierarchy or in the direct control of the Chicago-based gangs.1 However, because some of the early organizers of the most prolific street gangs in the country have roots in Mississippi, the state has a unique relationship with these groups, their senior leadership and families. In 2008, gang membership in the United States was estimated at 1 Million individuals belonging to more than 20,000 criminally active gangs within all 50 states and the District of Columbia – this represents a 20% increase from the 2005 estimate. In the four-year period from 2004 – 2008, reports of gang activity from local and state law enforcement agencies increased by 28%. According to a 2001 Department of Justice survey, 20 % of students aged 12 through 18 reported gang presence at their school. More than a quarter (28%) of students in urban schools reported a street gang presence, and 18% of students in suburban schools and 13% in rural schools reported the presence of street gangs. Public schools reported a much higher percentage of gang presence than private schools. As of December 31, 2010, the MDOC housed approximately 21,565 inmates, 3,015 or 14% of which are validated gang members. MDOC uses a Security Threat Group Validation Form (see addendum page 23) within their correctional facilities to identify gang members. Of those validated gang members, 2,611 or 87% were members of the core groups described in this report. The increase use of social media has created a new outlet for gangs to recruit members. Younger members have posted their affiliation with gangs on websites such as MySpace, Bebo, and YouTube. From 2008 – 2010; 6,122 validated gang members completed their sentences and were released. 23.97% are 31-35 years of age. Eighty percent (80%) of the incarcerated gang members are African American; 20% are Caucasian and less than 1% are Spanish/Hispanic/Native American. According to law enforcement officials throughout the nation, criminal gangs commit as much as 80% of the crime in many communities and are the primary retail-level distributors of most illicit drugs – the majority of the crack cocaine trade in Mississippi is controlled by members or affiliates of gangs.